This week on Feast Yr Ears, Sarah Weiner joins Harry to talk about the Good Food Awards and why makers and sellers of food are so closely connected in the goals of Seedling Projects, the Good Food Awards, and the future of real food. 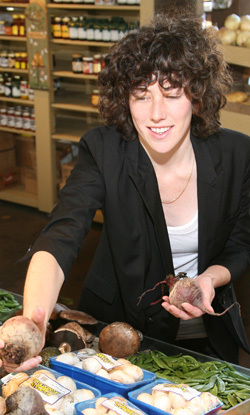 Sarah has worked side by side with the sustainable food movement’s founders and visionaries across the globe. As the Director of Communication for the Slow Food International Office in Italy, she was immersed in the roots of the food movement before heading to California to become Alice Waters’ “Girl Friday” (in Alice’s words) for two years. Next she spearheaded the development of Slow Food Nation as its Content Director, produced the 20,000 person Organic Food Festival in Bristol, England for the Soil Association, developed the Art.Food.Hope fund-raising campaign on the eve of Barack Obama’s Presidential Inauguration, and co-founded Seedling Projects.